Strong calves propel your body forward with more speed. Your calf is used for running, sprinting, walking and jumping. It engages when your knee is extended and your foot is flexed. Whether you jog or sprint, calf raises increase running speed by strengthening the contraction of the calf muscle. Calf contraction is important for the ankle flexion used to propel your body forward. The calf, on the back of the lower leg, consists of two muscles -- the gastrocnemius and soleus. The gastrocnemius is the larger, bulging muscle visible beneath the skin and consists of two heads that form its diamond shape. The soleus is flat, small and runs along the shin bone. The gastrocnemius and soleus merge at the base of the calf and connect to the Achilles tendon. The Achilles tendon inserts into the heel bone. There are three phases of running -- support, swing and follow-through. The support phase occurs when one foot is in contact with the ground. You use your calves during the toe-off portion of the support phase. Landing on the balls of your feet will maximize stride speed, while toe-running puts undue stress on the calves and heel running requires extra energy to toe-off, slowing you down. Checking the wear spots on the soles of your shoes will indicate where your foot is landing. It's a common myth that calf raises require less weight and more reps than other muscles. Use weight resistance and complete three sets of 12 to 15 reps. Feeling a burning sensation in your calves for the last few reps of each set indicates you are using enough weight. Stand on a ledge or step with your back upright and eyes straight ahead. Begin by raising your toes fully, then drop down so your heel is slightly below ledge level. Running faster means staying healthy enough to practice. Running requires high repetitions, making chronic injuries of the lower leg a common obstacle. A chronic injury is an overuse injury requiring weeks of layoff time to heal. 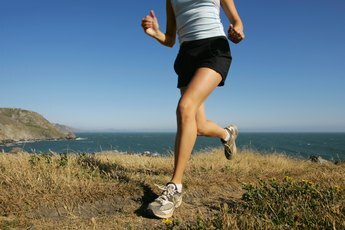 Running with injuries of the lower leg can lead to small fractures in the shin bone. 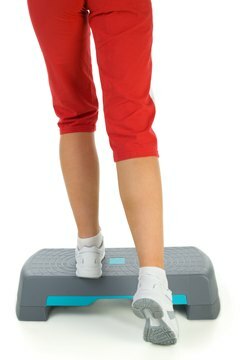 Strong calves stabilize the ankle, prevent shin splints and reduce strain on the Achilles tendon. 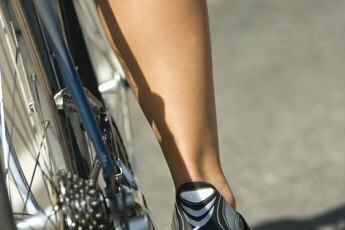 Complete calf raises on the same day as running to allow for rest days. What Running Shoes Protect Your Calf Muscles Better? Can the Deltoid Ligament Become Inflamed During Running?